The Buddy Rescue Foundation rescued and supported a number of animals in 2011, and in 2012 our work continues. Enjoy their stories and updates! Dixie and Belle are two senior mares we met early 2011 when their owner requested our help since she was too ill to care for them. We searched for an alternative to keep them together, but have not been able to find a suitable location or sanctuary. In order to avoid an uncertain fate, we are supporting their vet and feed expenses until an adopter or sanctuary can be found. Katie, a one-year-old Great Dane is special needs since she suffers from megaesophagus, a rare condition that causes her to regurgutate her food. Her owner surrendered her so we could find her a home, but despite much interest, her condition has been a stumbling block. We have managed her condition so that she has grown into a healthy and lively girl. She will stay with us since we are concerned the stress of moving to another home with irreparably trigger her condition and cause harm to her health. She is the sweetest girl and a real joy to be with! Gladys is a 2-year-old redbone coonhound, whose sole owner suddenly became ill. Family and friends took care of her for several weeks and approached us through our vet to see if we could find her a home so they didn't have to surrender her to a shelter. We immediately took Gladys in given the special circumstances so we could help her through this traumatizing situation, and so that her owner would know she would be well cared for. Gladys has adjusted very well and is enjoying her new home. Her case is just one example of the many animals that are left with no alternatives when an owner becomes ill or dies with no provision made for their care. 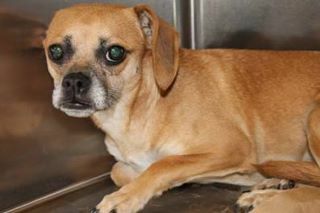 Buddy's shelter picture was posted to Buddy Rescue's facebook wall titled SCHEDULED FOR EUTHANASIA. He was a stray in an overcrowded KY shelter, and we rescued and transported him to PA to find him a home. Unfortunately, through no fault of his own, his first home did not work out so he was returned to us. Buddy remains with us, a sweet and very loyal boy that just needed a second chance at life! Donna's shelter picture caught our attention since she looked so scared! We inquired and found out she had been surrendered, perhaps because her owner became ill or died. We rescued and transported this scared little girl to her foster in NJ. Within days, she blossomed into a fun-loving spunky little girl and we found her a wonderful home. As you can see in her new picture, she's a sweet and happy girl with a new family in NJ that just adore her! 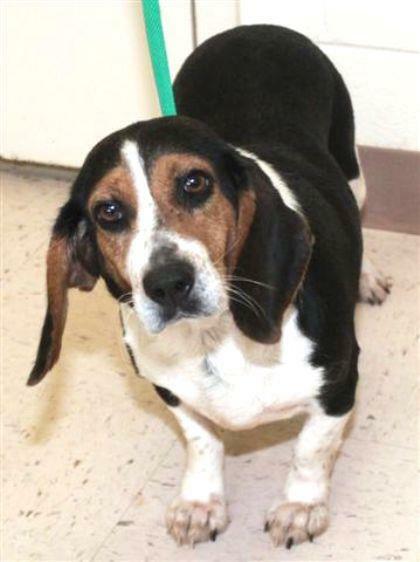 Nelda was in a GA kill shelter, her days numbered from the large number of hunting dogs surrendered or picked up as strays at the end of hunting season. One of our facebook friends saw her picture posted on our wall and asked us to rescue and bring Nelda to PA. Nelda is a sweet girl and now lives with her family of canine "brothers" in PA where she is loved and adored. 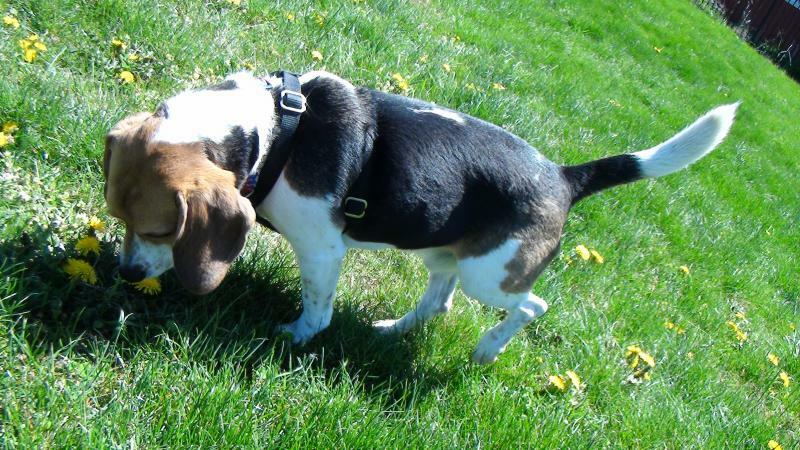 Mickey is a 4-year-old beagle who was surrendered to us by a family who no longer had time for him. Unfortunately we see this all too often, animals left behind when families decide to move on, breaking the lifetime commitment which is part of responsible pet ownership. 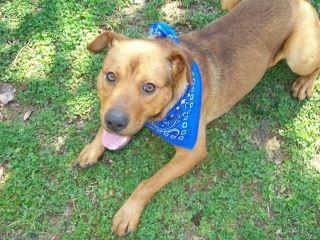 Mickey is an exceptional dog, very obedient and playful--he just loves to play fetch with a ball! Mickey was adopted in the Spring of 2012 to a wonderful "beagle loving" family, where he happily plays with his favorite tennis ball. Max is a pit mix who was running out of time at a SC shelter. He had been there several months, a shelter favorite because of his sweet personality. One of our fosters stepped up to take Max in so we rescued and transported him to NJ. Everyone just loves Max when they meet him! Max is available for adoption, so if you're interested in meeting this fun-loving guy, please call Barbara at 201-264-6968 or email barbara@buddyrescue.org. Annie is a special needs lab-corgi mix who was in a SC shelter as an owner surrender. We all saw her video on facebook, posted by the shelter in a last ditch attempt to get her to safety, and immediately knew we had to rescue this special girl. Her boundless spirit, despite an obvious hip ailment that affects her gait, is captivating as she happily bounds through life with an engaging spirit that touches your heart. Annie touched everyone as she made her way to us, and her new foster in PA chose to adopt her right away to give her the home she deserves. You always feel good when Annie is around! She is a very special girl! ANCA is a sweet girl we rescued out of a SC shelter--she had spent her whole life on a chain in a yard where other dogs were roaming free in a hoarding situation. Anca was described as "special needs" with no interest from rescues or adopters, so we pulled Anca and transported her to PA. At first she was timid and fearful of other dogs, but as she relaxed, we discovered she just didn't know how to be a dog. She finally learned by imitating the other dogs she lives with and is now a happy and playful girl, doing all the normal doggie things we had hoped she'd learn. Anca loves people and loves to give kisses and snuggles with you on the couch. Anca is truly a special girl that just needed the chance to learn to be a dog. 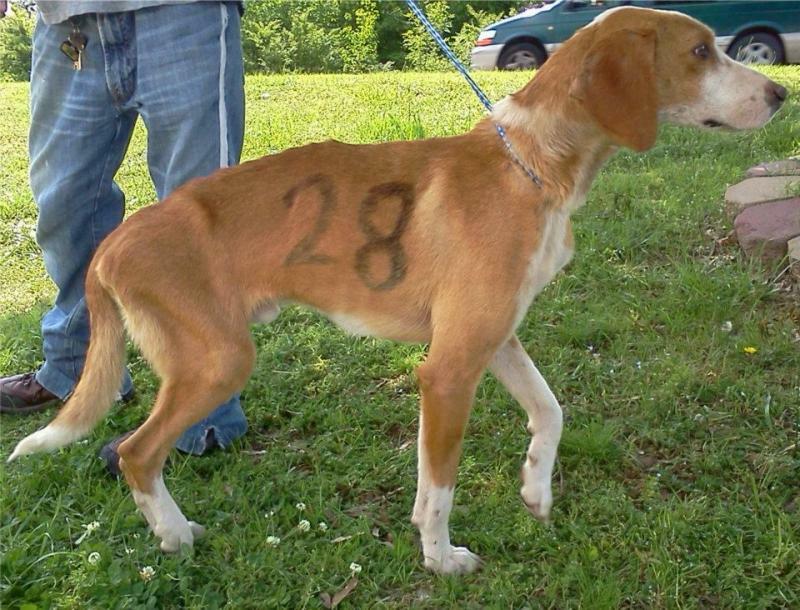 This is the story of #28, an emaciated foxhound mix who was running in the woods in SC, with an obvious broken hip and in severe pain. Many advocates of the shelter where he ended up, were desperate to find a rescue to take him so he would be saved and his hip could be repaired. The night before he was scheduled to be euthanized, one of our fosters stepped up so we could pull him and schedule his FHO surgery on his hip. Turns out he was an entrant in hunting competitions where numbers are marked on the dogs with dye and afterwards the dogs are abandoned or shot or killed int eh woods, his broken hip perhaps a result of an attempt by his owner to run him over with a car or truck. His new name is Walker, named after the shelter advocate in SC who lobbied so hard for him so that we were made aware of his case. Walker's surgery went well and he is gaining weight. His smile says it all--and Walker will soon be available for adoption.